My boyfriend and I loved the ricotta hotcakes that we recently ate at Bill Granger’s restaurant in Sydney. Now that I have a copy of the cookbook bills sydney food it was time to make them myself at home. It is such a luxurious way to start the day (or end it if you have a dessert craving at night). 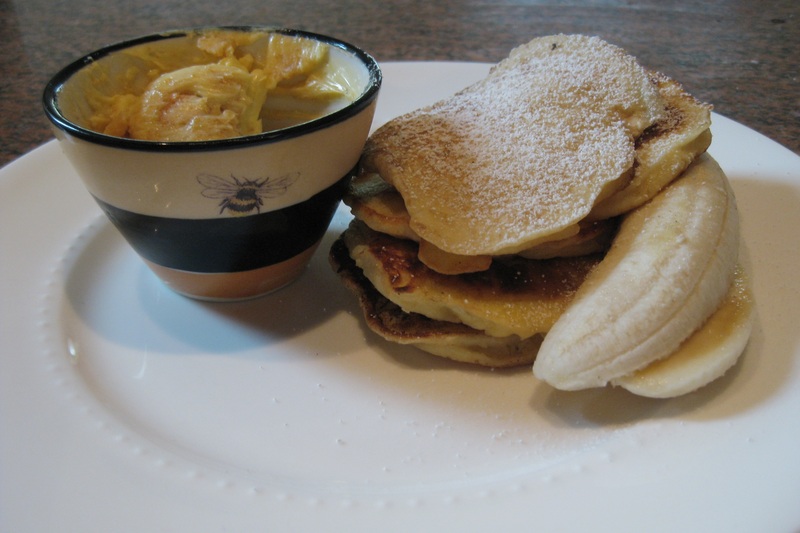 Create a stack of fluffy ricotta filled pancakes and fresh banana … dust it all with icing sugar…. and cover it with honeycomb butter. Delicious! I also managed to find a copy of the recipe online – Click here! On Friday afternoon I was on the train home trying to decide what to make for dinner. It had been warm and muggy all day but the sky was full of dark clouds threatening to burst any minute. I felt like something healthy but comforting for dinner – I was craving a fresh salad due to the heat but I knew that as soon as the storm hit a salad wouldn’t be enough. 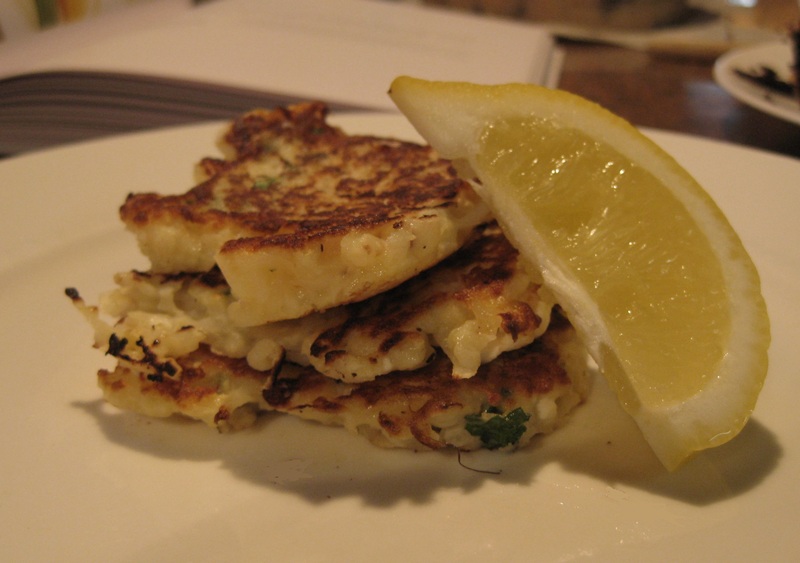 I remembered seeing a recipe for potato and feta pancakes in Bill Granger’s cookbook bills sydney food and I knew that it would hit the spot. My mind was quickly made up to make them and serve it with a big salad of mixed lettuce, tomato and cucumber – fresh, quick and easy. My love for Bill Granger is obvious. I love that his recipes are simple and stress free but the end product manages to punch above its weight in terms of flavour. They are quite healthy too which is always a plus when you know you will find yourself indulging in culinary treats all weekend! This recipe is in the breakfast section of the cookbook and makes about 10 pancakes. I’m sure it would be delicious at breakfast time but paired with a big fresh salad it makes a great dinner. Peel and grate the potato and onion. Stir in some salt and leave in a colander to drain for about 20 minutes (this step is important – you don’t want soggy pancakes!). Crack the eggs into a bowl and beat lightly. Squeeze remaining moisture from the potato and onion mix and combine with the eggs, mint, feta and flour. Season with salt and pepper. Heat some oil in a large frying pan. Add a few spoonfuls of mixture to the pan per pancake and flatten slightly. Cook until golden brown on both sides, this will only take a couple of minutes. Eat!